According to health experts, the fight against chickenpox has gotten better since the two-dose vaccination policy was introduced. A CDC report shows the number of chickenpox cases, roughly 85 percent, have declined in the U.S. The largest decline, noted in a CDC’s Morbidity and Mortality Weekly Report, occurred in children and adolescents between five and 14 years old. Before the program was enacted, approximately four million Americans suffered from chickenpox each year. The vaccine for protection against the varicella-zoster virus began in 1996. Before that, between 11,000 and 13,500 people would be hospitalized. When the vaccine was introduced, the number of chickenpox cases was still high, which is when doctors were advised to do a two-dose chickenpox vaccine – one between 12 and 15 months and the other between four and six years of age. The CDC reports state the results are encouraging. The agency said the number of chickenpox outbreaks had dropped significantly in the last several years. 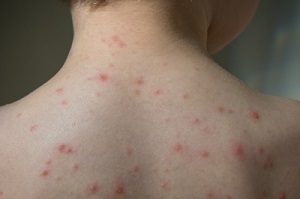 Chickenpox symptoms include fever, tiredness, and an itchy, blistery rash. More serious cases occur in people and adults with weakened immune systems and babies. Since the vaccine’s introduction in 1996 and, over a 10-year time-frame, there has been a 90 percent drop in the amount of chickenpox cases. Posted by News on Sep 5 2016. Filed under Featured, Health, New. You can follow any responses to this entry through the RSS 2.0. Both comments and pings are currently closed.